Generosity doesn't always translate into results. The reality is that not all grantmaking is effective. 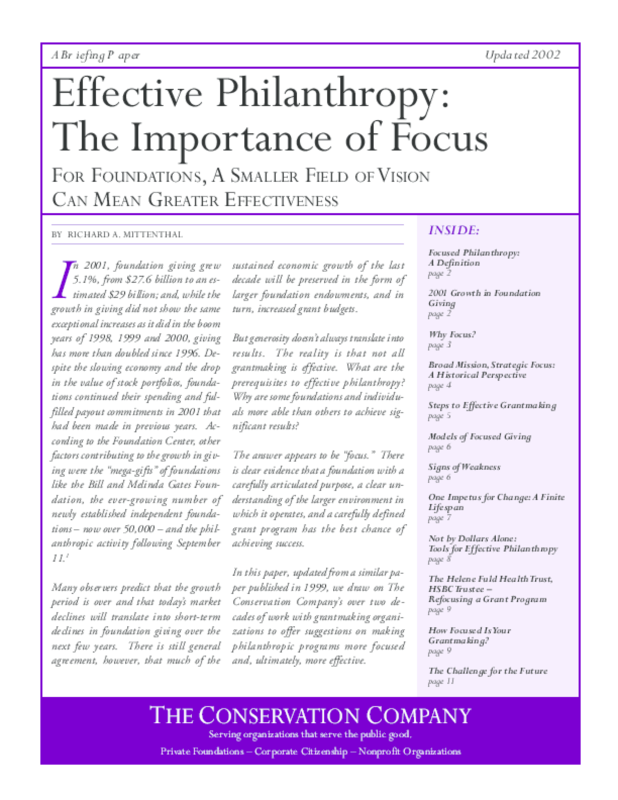 What are the prerequisites to effective philanthropy? Why are some foundations and individuals more able than others to achieve significant results? The answer appears to be "focus." There is clear evidence that a foundation with a carefully articulated purpose, a clear understanding of the larger environment in which it operates, and a carefully defined grant program has the best chance of achieving success. In this paper, updated from a similar paper published in 1999, we draw on The Conservation Company's over two decades of work with grantmaking organizations to offer suggestions on making philanthropic programs more focused and, ultimately, more effective.